Want to know how to research an occupation? If records of your ancestor are likely to exist? Guides to occupational records are a fantastic resource for the family historian. For those with UK Ancestors, you may find the following new books handy. 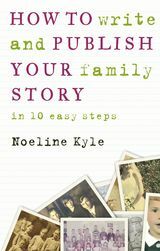 Or are you thinking about writing your family history but not sure where to begin? For those of you in this final stage (or getting close to it), you may be interested in the following additions to our collection. All new books are available in the Genealogy Centre.